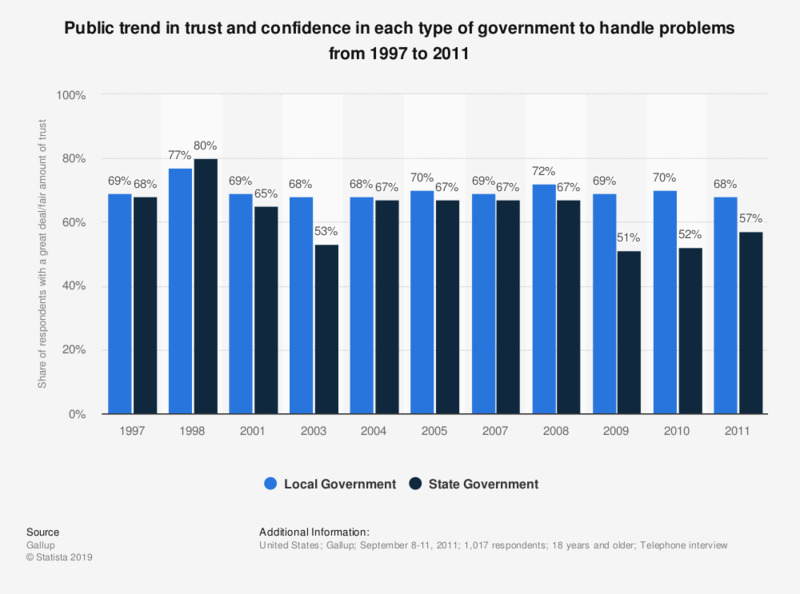 This statistic shows the public trend in trust and confidence in state and local government to handle problems from 1997 to 2011. The recent survey was done in September 2011 among 1,017 American residents. The preceding surveys were done in a similar matter. 70 percent of the respondents had a great or fair amount of trust in their local government in 2010, while 52 percent trusted the state government. During the survey, this question was posed as follows: "How much trust and confidence do you have in the government of the state where you live when it comes to handling state problems -- a great deal, a fair amount, not very much, or none at all?" and "And how much trust and confidence do you have in the local governments in the area where you live when it comes to handling local problems -- a great deal, a fair amount, not very much, or none at all?" The statistic above only shows the Top-Two boxes "Great deal" and "Fair amount."